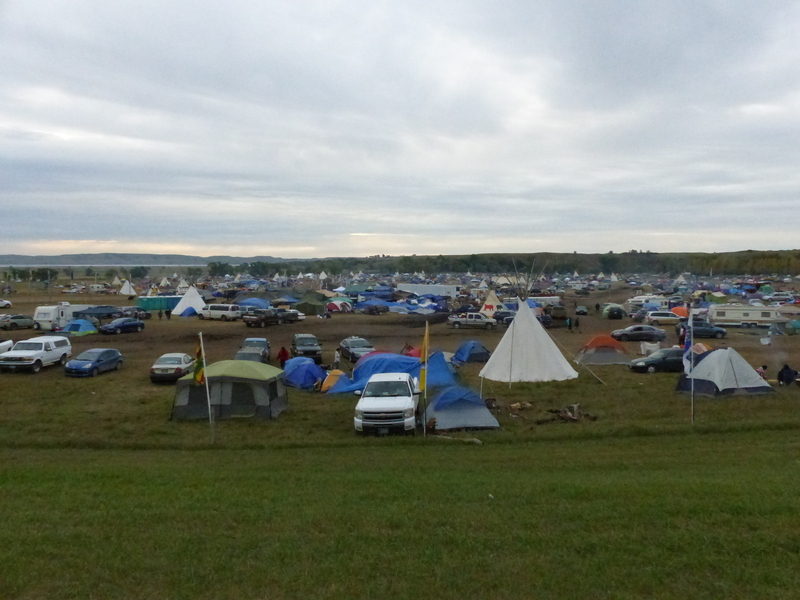 The Oceti Sakowin (main) camp near Standing Rock. Many people are interested in traveling to North Dakota to show their support for the Standing Rock Nation and its efforts to stop the Dakota Access Pipeline. However, some are unsure how to participate in a good and helpful way. A group called Solidariteam developed the following resources that discuss everything from current camp needs to the importance of following Indigenous leadership there. They also talk about how to bring what you learn at the camp back to your own communities. Please share. Questions? See the Standing Rock Solidarity Training on FB or email raffo95@gmail.com. The arrests and intimidation of Native-led water protectors in North Dakota stand in stark contrast to what happened when a group of white, anti-government protestors took over the Malheur National Wildlife Refuge in Oregon. An article in Yes! Magazine headlined: The Injustice at Standing Rock Is an American Story lays out the argument. Last January, when a gang of gun-toting, Constitution mis-quoting, anti-government militia occupied the Malheur National Wildlife Refuge in Oregon the reaction from federal law enforcement was patience. Days went by. Oregon Gov. Kate Brown (sounding very North Dakota-like) urged the federal government to crack down on “the radicals” before more arrived. We now know. And back in Oregon a few days ago, a jury found the Bundy gang not guilty. Click on the link above for the full story. It’s worth it. That seems like a naive or a cynical response. The very nature of the law enforcement response in this situation — more of a military operation, really — is deeply political. The way it is being carried out, it seems to be more about intimidating those opposed to the Dakota Access Pipeline than it is about “public safety.” Dakota and Lakota people and their allies have been locked in temporary cages, had the dehumanizing experience of having numbers written on their arms to identify them, and were subjected to invasive body searches. There could have been a way for law enforcement to engage in this situation where public safety was the priority. That did not happen. In spite of their words, our local sheriffs departments participated in a law enforcement operation that did take a political side in this dispute. Law enforcement is siding with the pipeline company and its construction schedule. It is good to know some in the Minnesota State Legislature will be taking a look at this issue in 2017. With sustained effort and unwavering optimism, we can ensure a vibrant and resilient Indian Country filled with possibility and prosperity. It is not a bad proclamation, really, it just stands in contrast to what is being allowed to happen right now at Standing Rock, with a heavily militarized response to people trying to protect their water and sacred lands. If “the future is still ours to write” as Obama says, maybe he could start by rewriting the chapter on the Dakota Access Pipeline.